Nathan’s mom is one fast lady, but her supercharged Impala crapped out. They have a Ford V8 and are looking swap it into something affordable but somewhat luxurious—but maybe her desire for a V8 car can be found elsewhere, too. What car should they buy? My mom, who is also a new grandma, blew up her supercharged front-wheel drive V6 Impala “SS” and now commutes 80 miles a day in a Suburban. We have a silky smooth 70,000 mile Ford 4.6 V8 we’d like to swap into something for the little old lady from Pasadena in her. So here is what you need to know about my mom—even though she is now a grandmother, she does not drive like one. She views fast and big as a safety feature. Small low cars are not her thing. She likes NICE things. An old big body Lexus or even a limo would suit her as long as it was nice up front because it’s spacious, comfy, and reserved, with an appearance that has aged well. A ‘90s Benz or a 5 Series would please her sense of status if it wasn’t dingy and had great paint and low interior wear. There just isn’t a lot from U.S. manufacturers to choose from. She won’t drive a T-Bird, Mustang, or Crown Vic, which would be the usual suspects for cheap, reliable, and fast. We have about $10,000 for this next ride and I can do most of the work myself if it needs it. Well, Nathan, it seems pretty obvious where you acquired your love for cars. While there are no shortage of tales of kids wrenching with dad, some of us, myself included, inherited our moms’ need for speed. For this project, I suggest you go with something that has a good platform but is a bit of an odd-duck so you can get it for a value. The big Lexus sedans are great, but now that they are coveted by gearheads looking for cheap, reliable luxury, the market can be difficult to find a quality example. So I say go with Japan’s forgotten luxury brand: Infiniti. The automaker has always gone through a bit of an identity crisis and has had a weird mix of rebadged Nissans and its own unique cars. The M cars from the mid-2000s were well equipped, somewhat sporty, and fairly durable. Will it work for your 4.6 Modular V8 swap? Never say never, but it’s not something we’ve heard of. It may do the job just fine with the engine it has, though. Here is a 2006 M35 for under $7,000 that suspiciously does not have the mileage listed, but looks like it could be a clean example. With its VQ-series V6 putting out respectable power numbers, you might even be able to save that Ford V8 for something crazy. I gotta admit it, Nathan, it’s not often I feel this confident about one of my recommendations here. But this time, I feel like I really have this figured out, and your mom is about to be one very happy motherdriver. Your mom likes nice things? Well, this 1991 Jaguar XJS is a very, very nice thing. Just look at it—the Jaguar is everything your mom wants—big, powerful, luxurious, a fantastic-looking car, and, for that sense of ‘status’ your mom wants, a Jaguar that looks like this will basically be broadcasting 1000 megawatts of raw status in a powerful status-beam everywhere your mom goes. Did I mention that it’s only $5000? And that it already has a massive V12 engine in it, so when you swap in that Ford V8, it’ll be like you’re doing it for economy reasons! This is a rational choice! The combination of that beautiful Jaguar styling and body—the long hood, the buttresses on the rear, the wood-and-leather British interior—with the considerably more reliable and serviceable power of a Ford V8 is a combination you just can’t beat. She’s going to love this thing. Make your momma happy. Expert 3: Patrick George - V8 Or GTFO That’s What I’m Always Saying!!! Today on WCSYB I’m kicking myself, because I was chatting with Jason about what car I should choose for this and he suggested a V8-swapped Jag XJS. That’s one of my dream car projects! Why didn’t I think of that? I blame Ballaban. Anyway, Nathan, let me reiterate that while the 4.6 V8 can make for fun swaps, you may just have an easier time getting your mom what she wants without all the work. But that’s not what you asked for. Do you think she can rock a Volvo 240 with that Modular V8 swapped in? 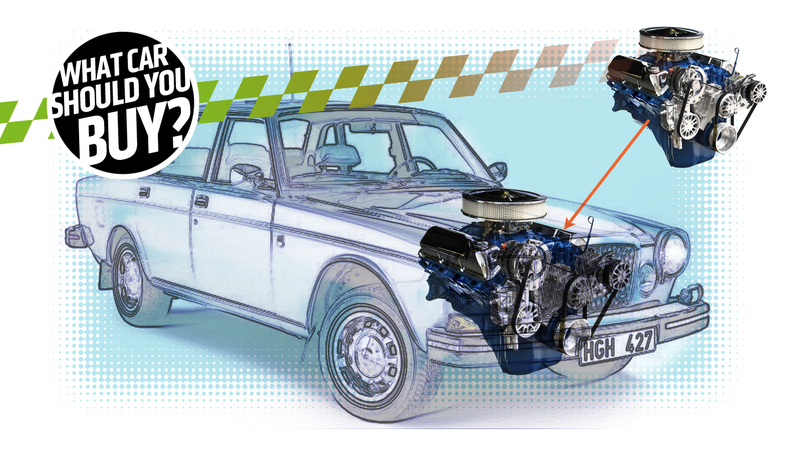 Volvos, as you may well know, have a long and proud history of being the recipient of potent engine swaps. Paul Newman had one, and this inspired David Letterman to do the same. I think you get yourself a 1980s or late 1990s Volvo 240—safe, comfortable, tough—in good shape and put the 4.6 into that. It seems it’s been done, too: here’s a thread on Modular Fords, though it’s lacking pics today. Good luck, and god swede. Tom, I love you, but only one generation of the Infiniti M is officially considered to be a Jalopnik Future Classic. The first generation of the Infiniti M sedan, the Infiniti M45 – which was only available with a V8 – is damn near the best-looking sedan to ever come out of the early 2000s. It came standard with a 340-horsepower aluminum-block engine, and as we pointed out back in 2013, that may not sound like a lot today, but that’s just 10 less than a Mercedes E55 AMG from the same era. It’s big and bold, long and low, and it’s got plenty of power, just like your mom wants. It was only sold for two years as well, making it not just a classically styled sedan, but a distinctive one as well. If you want one, there’s plenty to choose from for well under $10,000. Here’s one for just $6,600. Go nuts.